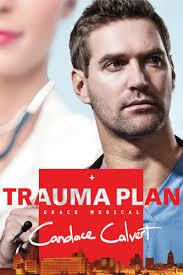 I picked up a copy of Candace Calvert’s book, Trauma Plan the other day and was happily drawn into a lovely romance. Chaplain Riley Hale has tried to rebel against her wealthy and overprotective parents, by becoming an ER nurse. She loved her job but her career was sidelined after a brutal physical assualt left her with serious and permanent deficits in her physical ability to do the job. As she tries to recover she works in the ER as a Chaplain. Life drastically changes the day she meets the ER Doc who some referred to as “Rambo.” Dr. Jack Travis has served his country, and devotes the majority of his time to helping the indigent people who lack medical care, by operating a free medical clinic. The two meet but initially clash. Jack realizes he could use Riley’s name to help get positive support for his clinic, which is under attack by the local community. Riley realizes that Jacks offer for her to volunteer at the clinic would be a way for her to practice her skills and possibly et back into full time nursing as she desires. What neither of them expect is that they would fall in love. As events unfold around them, they learn what is more important than their own selfish desires and that God uses everything as part of His perfect plan. I really enjoyed this book. Candace is a former ER nurse herself and is able to give credibility to the life of those people who struggle to help those in their most desperate hours. She weaves lovely details into the story and a few surprises. Most of all she treats the issue of physical and emotional pain and the way that can interfere or draw us closer to God, in a realistic way without being preachy. I loved this novel and look forward to reading more of her work.